Early Garden Home School: Thanks to Mildred Stevens, we have a wonderful book of the Garden Home School Parent Teacher Association (PTA) minutes during the 1930s. The book is all hand-written and the minutes for a meeting usually take two to three pages. All the pages were filled by December of 1941 and concluded with the Dec. 2 Executive Board meeting during which they made Christmas plans. The PTA members for five different years are listed by name. The Garden Home School children first began school upstairs at Chris Jager’s store in 1911. The three-room school was opened in 1912 for about 35 students. These PTA minutes note that the first PTA was organized in 1922 and those minutes were read at a commemorative meeting. In 1938 they reported 83 members and they actively promoted membership drives. At each meeting the class room with the most parents in attendance at the PTA meeting would be recognized and awarded a pennant although Mrs. Stephens noted in her November 1937 minutes that the winning classroom won a bowl of goldfish. Attendance at the PTA County Council and subscribing to the PTA magazine was promoted frequently. Song, music: The meetings usually opened with song, either group singing, piano or voice solos. “Miss Stiles sang two lovely solos.” In the 1934/35 school year, the singing was often led by Miss Laura Stiles, one of the teachers. “Miss Clara McDonald played two lovely violin solos accompanied by Miss Gooding.” In 1935 “Millie Becvar sang two songs.” Another time, Mrs. Knudsen sang two solos. Mr. Charles Taggart, a teacher and principal, sang at a special Feb. 14 meeting in 1935. This also featured an open house in the classrooms and performances by the children. America the Beautiful, Oregon My Oregon, America, and Auld Lang Syne were sung in 1930s. The fifth and sixth grade sang “Micky Mouse’s Birthday Party” from the early days of Disney. In 1940 June Farris played two pieces on her accordion. 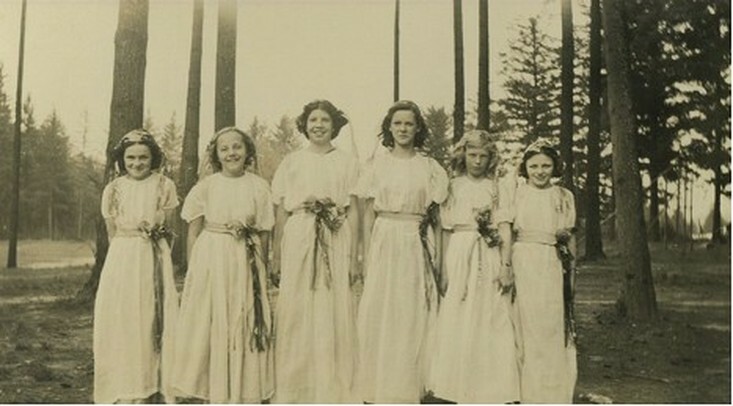 A Mothers Chorus was recruited in the late 1930s. They performed at meetings and various other events. Piano: 1937: Mrs. Solomon and Mrs. Vantzelfden were appointed to research buying a new piano. Later they reported that a suitable piano could be purchased for $70, more investigation. Mrs. Burns hosted another card party and the proceeds would go for the piano. After discussing bringing ten cent gifts for the Christmas tree, it was proposed that each person bring ten cents for the piano fund, along with a recipe for the tree. Finally in 1938, they approved the piano purchase for $100, “to be paid $25 down and $3.25 a month thereafter.” The last payment was made by December of 1938 and duly reported. Later they were to ask the music teacher to pay for tuning the piano since she used it. Budget: The budget for most years was usually about $67. This included the income of $1 dues and expenses for support of 4-H Clubs, Scouts or other children’s organizations. 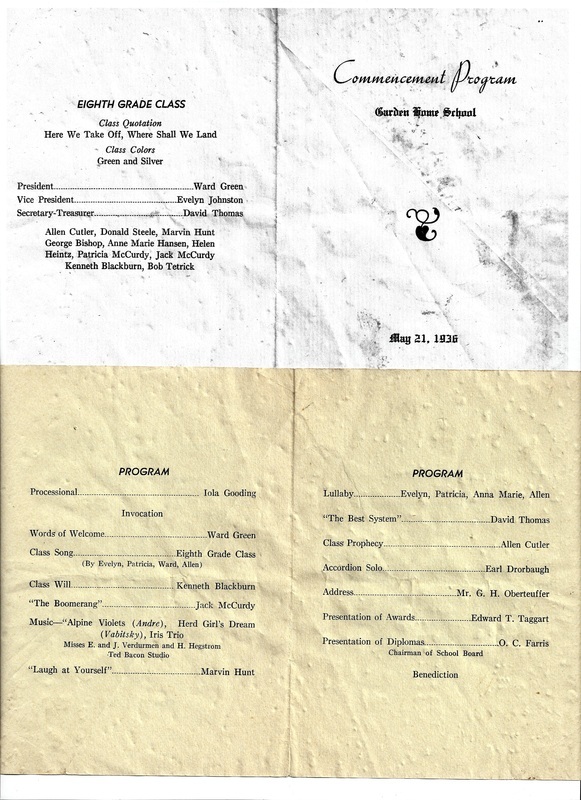 In 1935 a program was held to raise funds to pay Boy Scout membership dues. In 1936 they had a “penny carnival.” They also received $27 for a dinner and $15.70 for a cooking school. The $59 budget in 1936 included $10 for the 4-H clubs. Feb. 1939: The PTA would receive twenty-five cents for each person touring the Riverview Abbey on Feb. 20th which then raised $3. Programs: 1936: Mrs. Stevens and Mrs. Upchurch were appointed to arrange for a medical clinic for G.H. school children. A later note refers to 20 children having TB tests. Several reports noted that a doctor would be at the school to give smallpox vaccinations. Notices would be sent urging parents to bring children who have not had smallpox. 1936: a panel discussion on “Why we need a new auditorium.” The May 1938 meeting was held in the school auditorium. At another meeting Mr. McFadden of the First Presbyterian church gave a talk on “Intelligence”. Vlasta Becvar performed a dance along with other students giving readings for Founder’s Day. Rev. Dickie gave a talk on “Character Building.” 1937/38 year: Dr. McDonald spoke on “Tubercular testing.” A tour of Davidson Baking Company cost twenty-five cents admission which included the tour, lunch and card games for the afternoon. 1938: They read an article on “Save the Battleship Oregon Campaign.” A number of children performed in the auditorium at the 1938 meeting including a dance by the Becvar twins. Mr. Leisure from the Dept. of Vocational Education spoke on his experiences in Africa. An article on “Marihuana” (original spelling) was read. In 1941 4-H awards were given to: Lorraine Knudsen, Jim Godwin, Gwendolyn Steele, June Farris, Jean Godwin, Jane Jensen, Myles Ralston, Billy Schulz, Charles Coey, Donald Smith, Nancy Hyde, Evelyn Knudsen, Shirley Reding, Rosella Nebert, Ann Coey, and Lou Ann Hickman. In Sept. 1941 the County nurse gave a talk on “Infantile Paralysis” (polio). A preschool clinic may be developed along with Metzger. The Nov. 1941 meeting featured Captain Dennis of the Vancouver Barracks speaking on National Defense. They also appealed for donated silverware for the cafeteria. WPA: Works Progress Administration was President Roosevelt’s New Deal agency to provide employment to the millions of unemployed people during the Depression. They built all kinds of public works in addition to employing a variety of artists, writers, teachers, etc. The WPA built the current gym/auditorium. Mrs. Powell reported that Mrs. Smith, a WPA instructor would be in charge of summer supervised play. 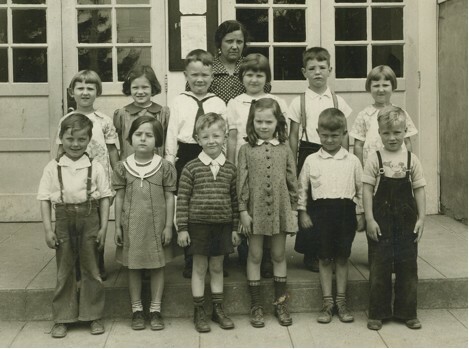 Miss Langley of the WPA office gave a talk “regarding a WPA cook and free hot lunches; they pay the cook but the school must be able to provide everything else.” In order to get a cook, the school needed to have at least 20 children who the teachers felt were not getting sufficient food. Members were encouraged to plant extra rows of vegetables for the school. Business: 1936: Mrs. Ketcham and Mrs. Truman were appointed to research “what teachers were available to us under the WPA.” A committee was appointed to meet with the School Board to draw up planting plans for the grounds. Mrs. Stevens reported about starting a “better English” class at Mrs. Burn’s residence. 1937/38: Mrs. Hetlesater announced a “Mothers & Daughters banquet to be held at the church.” The motion carried that the PTA sponsor a Bible School for children every Monday at 3:30 pm. In Oct. 1940, a WPA Handicraft class was scheduled to meet after school on Mondays at 2 pm. They also collected toys for the kindergarten room. 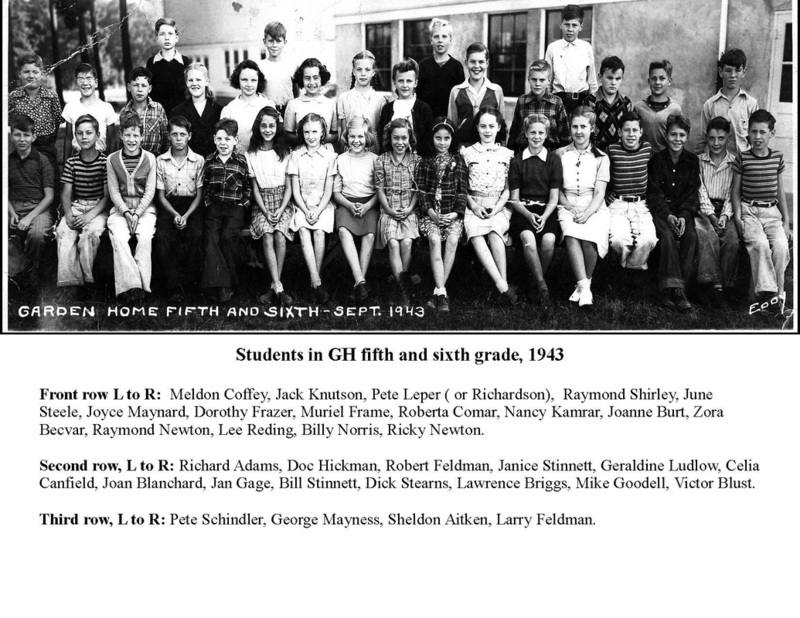 In January of 1941 they discussed fixing up the old cafeteria room for a 4-H Club room and voted to provide some funds. Sept. 1941: Dishes and utensils were purchased for the cafeteria for $33.75. Mrs. Hall announced that the cafeteria would open about Oct. 1 with a WPA cook. An appeal for home-canned fruit was made. An average of 89 hot lunches, five cents apiece, were served each day. In 1941 the Executive Board voted to purchase the sink for the cafeteria and to apply funds to the down payment on the two gas stoves which the PTA will buy for the cafeteria. Beginning Multnomah Blvd: At the May 14, 1941 meeting, a “letter was read from the Oregon Electric Hiway Committee requesting our cooperation in obtaining a hiway on the old Oregon Electric right-of-way. The hiway is to run from 19th Avenue and Barbur Blvd. to Garden Home.” he PTA instructed the secretary to request more information before making the decision. First Aid Car: In order to provide funds for the community Tualatin Valley First Aid Car, they began a basket with a home-made food article and a piggy bank. This was to be taken to a neighbor who would put in thirty-five or fifty cents, eat the food and replace it with another food item. Thus the “Piggy Bank and Basket” began. At the Nov. 1941 meeting it was announced that they had raised a total of $2415 for the First Aid Car. Stop Signs: 1938: Discussion regarding the stop signs at the school crossing and that they would discuss this with Washington County authorities. They reported at the next meeting that the stop signs would be replaced and they wanted improved enforcement of the stop regulations. Officers and committee persons: The following names list some of the people who served during the 1930s: Mrs. O.C. Farris, Mrs. Garrde, Mrs. Walter Lyons, Mrs. G.E. Steele, Mrs.C.R. Martin, Mrs. Hunt. 1936: Mrs. Nebert, Mrs. J.F. May, Mrs. Burns, Mrs. N.H. Stephens, Mrs. Green, Mrs. Huffaker, Mrs. Thompson, Mrs. Koester, Mrs. J. Thomas, Mrs. Lewis Schulz, Mrs. Kenneth Frazier, Mrs. A. Zacher, Mrs. J. Vantzelfden, Mrs. W.A. Godwin, Mrs. D.E. Hamil, Mrs. Gladys Green, Mrs. R. Sturtevant, Mrs. Allan (Beulah) Maness, Mrs. Gibbs, Mrs. Land, Mrs. A.A. Bernard, Mrs. H.C. Coey, Mrs. J.H. Holmes, Mrs. Lee Fryer, Mrs. Stotts, Mrs. Dene Hickman, Mrs. Henderson. The address for most of the ladies was simply Garden Home but some were listed as Route 6 or 8 along with a box number of 1692 or 1722, etc. The Farris family lived on Westgard at Route 8, Box 1784, currently the house at 7795 SW 87thAve. Mrs. Nebert was further down Westgard at Box 1722. “Oh, there’s a boy on roller skates!” cries Ma. Garden Home PTA minutes 1934 to Dec. 2, 1941. Still researching: type of card games at the card parties, better understanding of the early cafeteria room and 4-H Club room. This entry was posted in Early History, School and tagged PTA, School. Bookmark the permalink.